FL7M-C Series DC 2-wire Environmental Resistant Cylindrical Proximity Sensors. 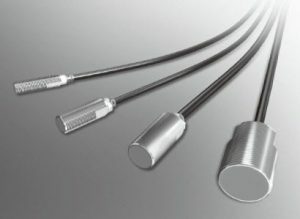 These proximity sensors with oil-resistant polyurethane cables are designed for use in harsh environments that cause swelled cables and coolant intrusion in regular sensors. The FL7M-C series has a special sheathing and an extra seal between the cable and housing that has proved a successful solution to the problem of coolant infiltration along the cable core wires. This sensor is ideal for automobile assembly lines where cables are often attacked by coolant.